Of all the bands that emerged from the intensely fertile period in German musical history between 1968 and 1974, producing sounds commonly categorised as Krautrock in this country, it is perhaps most difficult to sum up what Faust were all about. Kraftwerk are the most influential electronic band ever, Can’s world-straddling ethno-funk made them hugely important, and Neu! invented the colossally important motorik rhythm. But Faust are harder to pin down, being more of an exercise in situationism and anarchy than any single kind of sonic form. This free-improv, proto-industrial, garage rock drone outfit were all but forgotten about by the mid-80s, and it was only thanks to the evangelical work of Chris Cutler (Henry Cow) and Julian Cope that their name was kept alive. More recently they have supported Radiohead and recorded an album with white-noise hip hop act Dälek, but their name still causes confusion, not least because there are two line-ups of the group currently in operation. The other, not as good Faust (which includes original members Werner ‘Zappi’ Diermaier and Jean-Hervé Péron) released C’est Com…Com…Complique in 2009 and has toured extensively since. 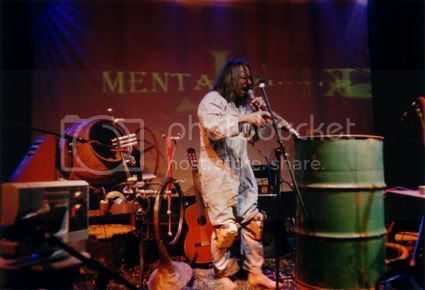 Anyone who has seen their slightly whimsical, hippyish performances using cement mixers might be forgiven for not wanting to check out Faust Is Last. But that’d be a shame, as this is by a different group entirely, fronted by Hans-Joachim ‘Jochen’ Irmler. When this album was envisaged in 2006, it was intended to bring the group full circle, to rediscover their radical roots. And it certainly pushes them out of the realm of daft psychedelia and firmly into the world of avant-rock, industrial, drone metal and lo-fi. Feed the Greed features heavily treated, back-masked, Arabic keyboard lines, acidic guitar drones and the kind of echoing drum pattern that wouldn’t be out of place on a more recent Killing Joke or Nine Inch Nails outing. It certainly suggests the band is keeping up to speed with modern production practices. Hit Me, a monstrous lo-fi garage stormer, should have newer but similarly styled bands like Harlem and Times New Viking looking at the floor with red cheeks, as it makes them look sonically lazy by comparison. There is a slightly naff ‘diss’ song called I Won’t Buy Your S*** No More, but otherwise this album (with extra disc of dubbed remixes) is as good as anything Faust have done in their 40-year career. Damo Suzuki is returning to the Trades Club, Hebden Bridge (West Yorkshire, UK) on Sunday 25th september 2011. Not only that, but opening the night are Art Error Ist – a new project featuring Jean-Hervé Péron of the legendary Faust accompanied by Steven Stapleton and Andrew Liles of the equally legendary Nurse With Wound. It’s a double-whammy of a show! Joining Damo on stage will be the ultimate Hebden supergroup, including members of Alfie, Badly Drawn Boy, The Ukrainians, etc. Art Error Ist features Jean-Herve Peron, Steven Stapleton and Andrew Liles. One of the founders and leaders of Faust, Jean-Herve’s distinct French vocals can be heard on many classic Faust tracks new and old. Steven Stapleton founded Nurse With Wound in 1978 and is the only constant member. Andrew Liles, as well as being a distinguished solo artist, is a regular member of Nurse With Wound and Current 93. Doors will be at 7.30pm.